Riviera is a 16.2hh mare imported from France. Her sire is the KWPN stallion Olivi (Jazz / Aktion), he is currently ranked 2nd behind his sire Jazz on the KWPN Sire Rankings. 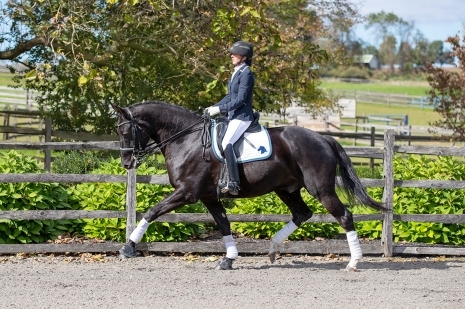 Olivi’s offsprings include the US based Iron Spring Farm's stallion UB40, ranked #6 USEF Dressage Sire in 2016. Riviera’s Oldenburg dam is the daughter of the famous stallion Rubinstein I. Riviera’s full brother Renoir has shown up to Grand Prix. Riviera has competed in young horse classes in France, and qualified for France YH Nationals as a 6 Years Old with scores in the 70’s. She made her first show season in the US last year as a 7 years old at Second & Third levels, with consistent scores in the high 60’s and up to 71% with a USDF Gold Medalist rider. Riviera was the USDF Region 9 Reserve Champion at Third level last year! She has 3 very good gaits, and - like her brother - already demonstrates great abilities for collection. She is very confirmed at Prix Saint Georges and schooling all I1 movements, and has started one tempi changes, passage & half steps. She goes both on a snaffle or double bridle. She is not a hot mare, yet sensitive and forward thinking under saddle. She is not the type of mare to be affected by seasons or cycles. She is sweet and not opinionated hence suitable for a timid Amateur rider in my opinion, but would also make a great international quality horse for any ambitious rider. She is ridden by my 13 years old student without difficulty. Riviera has a very sweet personality, she is very cuddly and loves the attention! She loads easily in the trailer, trail rides, and is up-to-date with all vaccinations, dentist and coggins. She is lifetime registered with both USEF & USDF, holds a Selle Francais breed passport and a FEI passport that can be used for CDI participation. Currently located in Massachusetts, price negotiable.